FRANKFURT - Volkswagen Group took a surprise charge of about 2.5 billion euros ($3 billion) in the third quarter as plans to buy back or retrofit tainted diesel cars in North America proves more complex than expected. The additional provisions will hit operating results in the third quarter, which will be reported on Oct. 27, VW said Friday in a statement. The latest charge brings total damages from the diesel-cheating scandal, which erupted more the two years ago, to over 25 billion euros ($30 billion). VW'S third-quarter operating profit was forecast at 4.45 billion euros, according to three analyst estimates compiled by Bloomberg. 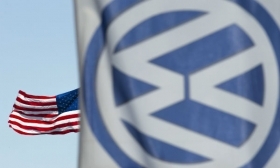 VW said the increase in provisions relate to the buyback or retrofit program for 2.0-liter diesels, which is part of its settlements in North America. The program is proving to be "far more technically complex and time consuming," the company said. VW has recalled around 11 million vehicles worldwide since admitting two years ago to manipulating emissions tests in the U.S. About 8.5 million of those are in Europe. "The size of the provision is surprisingly large, considering the numbers of cars involved isn’t very large," said Juergen Pieper, a Frankfurt-based analyst with Bankhaus Metzler. "It shows VW remains some distance from coming through the scandal." VW is struggling to draw a line under its diesel crisis. This week, Munich prosecutors arrested the automaker's former top engineer, Wolfgang Hatz, in connection with the scandal, German reports said. The scandal set off a backlash that has led consumers to turn away from diesel technology amid concerns about pollution and driving bans. That creates problems for Volkswagen as it relies on diesel cars to boost profit and lower carbon-dioxide emissions to reach tightening European environmental targets.